God of comfort and grace, you have called and invited me to take up my cross and follow you. How complicated I have made this. And, indeed, it is complicated. But it is also simple. When you ask me to take up my cross and follow you, if I simply do it, I learn what it means. 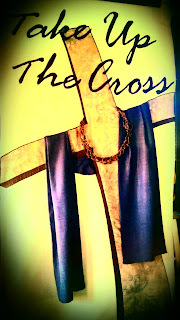 After just a few steps in pursuit of you I quickly discover that the cross on your back doesn't really belong to you. The cross you carry is actually mine. A few more steps and I discover that I don't need to carry a thing. But you have called and invited me to take up my cross anyway. How odd! If I am to take up my cross in the same way you did, then I discover that my cross is actually someone else's. You have invited me to share in your sacrificial generosity and pour out my life to give life to others. If I am going to follow you, I need to do it for the sake of others, not for my own sake. You took up my cross to give me life, may I take up the cross as well to give life to the people around me, even my enemies. May I offer myself, my hands, my feet, my soul to be a response to the cries for help that have reached your ears. Help me see where I might take up the cross and bear the pain of another to discover the joy of your resurrection. Taking on pain to discover joy?! Another oddity of the Christian life! But again, as I do it, I discover what it means. Simplify this whole thing for me, O God. Let me simply follow and fill in the details along the way. Amen.